Gov. Paul LePage has signed a bill that would require food producers to label foods that contain genetically modified ingredients. The law makes Maine the second state in the country to pass such a measure. However, other states must adopt similar legislation before Maine’s labeling provision goes into effect. The governor promised last year to sign the bill, which was sponsored by Rep. Lance Harvell, R-Farmington. His signature is symbolic because legislative rules don’t allow the law to go into effect until the Legislature adjourns later this year. However, supporters of the bill hailed the law’s eventual passage as a victory for advocates of laws mandating the labeling of genetically modified foods. Such proposals have been introduced in nearly 30 states as part of a national effort to compel Congress to enact a comprehensive labeling law. 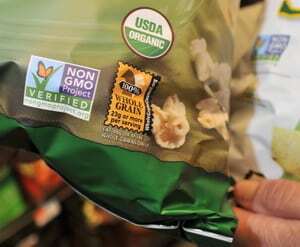 Previous GMO labeling efforts have been staunchly opposed by agribusiness and the biotech food products industry, which have also spent millions to defeat ballot measures and state legislation. Industry argues that labeling genetically engineered products unfairly stigmatizes modified foods despite a dearth of scientific research proving that they are any less healthful than those that are grown conventionally. The U.S. Department of Agriculture estimates 70 percent of the products sold in American supermarkets contain genetically modified ingredients. The Food and Drug Administration regulates genetically modified foods, but regulators have left testing to the industry that is producing them. She added, “We thank Gov. LePage for recently signing the bill into law and thank Maine’s Legislature for passing the bill with overwhelming support last year. Still, the Maine GMO labeling law faces another challenge. The law doesn’t go into effect unless five contiguous states, including New Hampshire, pass labeling laws. Late last year, the prospects of a New Hampshire law dimmed when a committee broke along party lines to oppose a labeling measure there. The New Hampshire Legislature will take up the bill this winter. The national battle over labeling laws has pitted activists in the organic food movement against a consortium led by the biotech industry and corporate food producers, such as General Mills, Nestle USA and Monsanto. It appeared that industry heavyweights were initially taken aback by activists who introduced labeling legislation this year in at least 30 states, according to the National Conference of State Legislatures. However, reports from New Hampshire indicate that the industry has rallied and become more effective. The Maine bill brought together such factions as libertarian Republicans and liberal Democrats, creating strong support. So far, that hasn’t happened in New Hampshire and the bill has become more partisan there. The provision requiring passage in contiguous states was added to the Maine bill to help build broad support. Proponents of the bill said the provision would quell concerns about an almost-certain lawsuit by industry groups and Monsanto, which vowed to challenge the laws in Maine and Connecticut on the basis that they violate the free speech and interstate commerce provisions of the U.S. Constitution. Maine Attorney General Janet Mills told lawmakers last year that the bill was almost certain to face a legal challenge, and said she could not guarantee that her office could defend its constitutionality. Already 64 countries around the world label foods that contain genetically modified ingredients, including all of Europe, Russia, China, Brazil, India and Saudi Arabia.